An impeccable denim shirt lets you flaunt your fashion sensibility flawlessly. 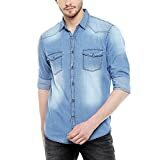 This jean shirt brought to you by Dennis Lingo looks great when paired with jeans and other bottom wear. The faded look gives it a vintage appeal, while the breathable cotton material makes the shirt comfortable to wear. This lightweight denim shirt with a neat Chinese collar is an appropriate pick for men and can be worn as a layering piece too! Create multiple looks by wearing this casual denim shirt with a curved hem which looks good both tucked in and out. The shirt features a Mandarin or Chinese collar that exudes a cool yet calm vibe. The collar rises a little above the neckline and is easy on your skin. Featuring a full button placket, this casual shirt for men adds a touch of versatility to your wardrobe. You can wear this shirt as a layering piece or on its own to match with your denim pants or chinos. The full sleeves present the wearer with the choice of wearing them as they are or rolled up. You can flaunt either look based on the occasion or comfort quotient. 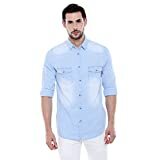 Look effortlessly trendy in this denim shirt for men from Dennis Lingo. The washed effect of this shirt adds to its appeal. It has a faded look along the chest, shoulders and sleeves which exude a vintage vibe.